Writer and director Andrew Finnigan’s Simple Creature opens strongly–through realistic dialogue and confident performances by the lead actors, audiences are introduced to Em (Carollani Sandberg), a kind and friendly college student, and her burgeoning relationship with country boy Seth (D’Angelo Midili). While Seth has little patience for the ever-growing technology that surrounds us, Em comes from a family whose entire lives appear based around science. Em’s father, a scientist at a bio-technology lab, will play a critical role in the story once Em is involved in a horrific bus accident. While Seth is told that Em has died in the violent crash, she has actually been “resurrected” by her father’s laboratory team and turned into a better, stronger, and more intelligent human. One downside to this “new beginning” is that Em has lost all memories of her former life, including her relationship with Seth. As one might expect, over the coming years Em begins to recall certain aspects of her life before the bus accident, and she reconnects with Seth (who has some family and property troubles of his own to deal with) in order to assemble all the pieces together. This exposition works well in the film: the script is taut and serious, the actors are top-notch, and the bus accident is depicted in a singular moment of sudden and shocking terror. At this point, Simple Creature has everything going for it. Audiences who watch Simple Creature will quickly discover, however, that the film is not categorized into any particular genre–it’s not a horror or thriller film, and there’s little suspense except for perhaps a moment or two in the final scenes. It’s mostly a dramatic and/or philosophical talk-fest, with many scenes reiterating the same conflicts between Em and her father, Em and Seth, or Seth and his difficulties in operating the farm that he and his mother are attempting to run after his father dies. There are moments that suggest that an exciting sequence is about to occur, especially as the conflict between the bio-tech company and Em intensifies, but the film often cuts to the next scene before delivering the goods. This slow, occasionally meandering pace might have been the result of a smaller budget, but ultimately the somber mood begins to weigh on the viewer. As Finnigan’s film nears its end, audiences may find themselves waiting for a pay-off that never really comes. 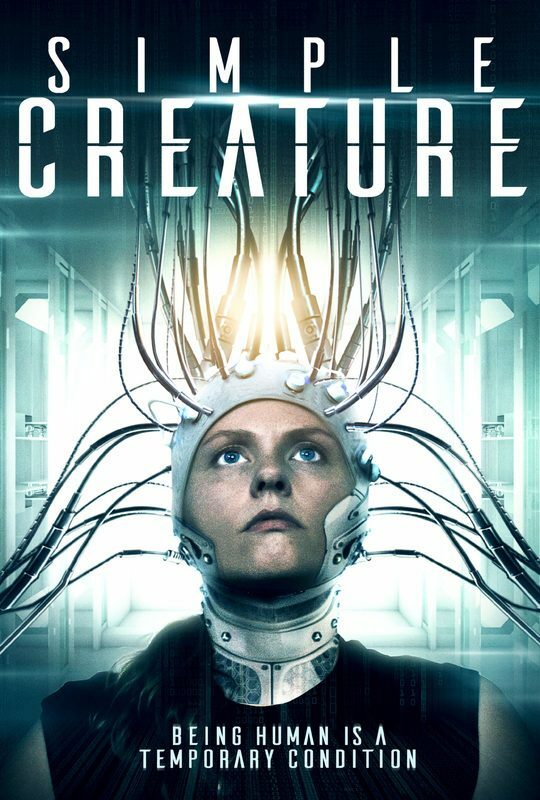 Despite the lags (the film is only 90 minutes, but feels longer), Simple Creature is a well-made picture: the cinematography, by Sam Graydon, has an ethereal and poetic tone at times, especially as Em grows more aware of what has happened to her; the acting, especially from Sandberg, Midili, and Russell Hodgkinson (as Seth’s uncle), is consistent and bold, the dialogue among the characters realistic and lean. Those wanting sci-fi thrills or special effects involving biotech transformations might want to look elsewhere, but as a curious and ruminating work of moody drama, Simple Creature is effective and worthwhile.